If you enjoy listening to AM, FM and weather while on the go, you will love the Sangean DT-400W. 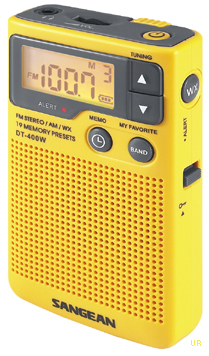 About the size of a pack of cigarettes, it will fit in your shirt pocket and receives AM, FM and FM stereo, plus seven NOAA weather channels. Other features include: 19 mixed memories, 90 minute auto-shutoff, lock switch, 1.3 x 0.6 inch backlit display, clock, deep bass boost, belt clip, built-in 1.85 inch speaker, stereo-mono switch, earphone jack (3.5mm) and supplied light-weight stereo earplugs. Requires two AA cells (not supplied). Coverage: 520-1710 kHz, 87.5-108 MHz and NOAA channels. Only 2.5 x 4.2 x 1.2 inches 3.6 oz. Copyright 2008-2018, Universal Radio, Inc.